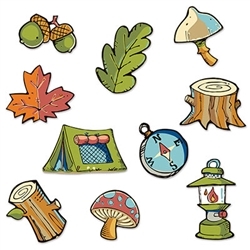 Use these Mini Woodland Friends Cutouts at your upcoming scout meeting or woodland theme party! This package features small paper cutouts with designs of common things you would either see or take with you into the woods. You'll see cutouts of a compass, a mushroom, a tent and a stump, among many other things. The cutouts range anywhere from four (4) inches to seven (7) inches and there a total of 10 in the package.